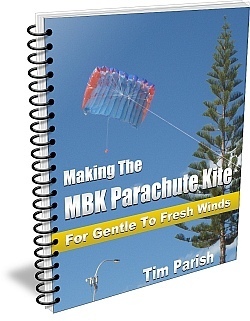 Have a look at Making The MBK Parachute Kite if you would like to make and fly one yourself, from my e-book instructions. The e-book is a PDF file download, from which it's easy to get print-outs. Approaching the beach it seemed promising since there were white-caps out across the ocean. Minutes later, after arriving on the sand, it was a different story since the tide was well up. However, there were signs that the water was receding so with that I found a spot and checked the breeze. Only 9 kph gusting to 12 kph?! That was odd, but it was still worth putting the kite up for a while. Space was very limited. To gain an extra few meters, I placed the bag on damp sand not far from the water's edge. The line angle was clearly boosted by the steep slope forcing the breeze up and over. For some minutes I scampered around getting stills and video from various angles. Despite the Winter weather, the sun was finding substantial gaps in the cloud cover and pouring through brightly. At one point, after rescuing the kite from a rock landing, I photographed directly upwards at the kite while standing part-way up the rock-face. That'll be the closest in-flight pic of this kite taken so far, I'm sure. A seagull soared close by but turned away just as I framed up the shot. Bother. Within a second or 2 the bag was taken to safety a couple of meters towards the rocks. The kite kept flying. A glance to the north confirmed that the water had also reached the steps where I had descended to the sand! Wasting no time, the kite was taken down and stuffed into the bag. Further down the beach to the south it wasn't clear if the other off-ramp would be accessible without getting wet. I was out of there pretty quick, up the concrete steps. So, the hardy little 'chute still flies. It's been many many months now since the construction of the MBK Parachute was first documented. There's a lot of taping in the kite's construction but that has the benefit of extra durability it seems. Unfortunately, the weather during the shoot was atrocious - 40kph gusting to over 60kph at the airport just a few km South of our location. The press photographer had to work with just a couple of kids and a couple of fairly big inflatables flown by kite club members. Small cheap kids' kites would have been torn apart in the ferocious blast! The wind speed swelled and moderated, affected by rain squalls passing through in the vicinity. Fortunately we didn't actually get rained on during the photography. The kids posed on the railings at the top of a skating half-pipe. Meanwhile a Trilobite pilot kite and a red Parafoil moved around - a lot - in the background. The press photographer shot upwards from ground level, waiting for the kites to co-operate every 10 seconds or so. Another shot involved some fake flying... The boy hung onto a winder as I held the other end of the line, to simulate an out-of-sight kite. Finally, it looked like the photographer was not going to get the final shot required. This involved 2 kids lying on the grass with a kite held just above them. The Trilobite could be flown within a couple of meters of the grass, but there was no way it would look right when held at either side. Then I had an idea... We ended up having the boy hang onto the connecting line of the MBK Parachute kite bridle. Although the air was rough, at such a low position the wind strength was less extreme. The rectangular canopy popped open and flew just above and behind the kids' heads. Every once in a while, the canopy would flop to one side and collapse, but the cross-flow vents did their thing and soon pumped up the cells again! Just as some 'icing on the cake', it seems the paper might be using one of the Parachute images to advertise the Festival on the front page. Rather cool, if it happens! It was supposed to be an AKFA kite fly when I went out yesterday. It wasn't totally surprising that no-one else was there, given the high gust strength of the Southerly breeze. A kite surfer and 1 or 2 wind surfers were on the water, with white-caps everywhere. Strong conditions! Not to worry, the MBK Parachute kite likes a bit of breeze. Initially I had a bit of trouble launching the Parachute as it blew around from side to side on a short line. Often folding a tip under before collapsing to the grass. More tail seemed a sensible thing to do in the conditions, so I added a generous length of Tyvek. Just a thin strip, but it did the trick. Finally, on several meters of line, the Parachute was up. This kite doesn't like extreme side-to-side line angles. But on enough line it never gets out to such angles and behaves from then on. Letting line out to 30m (100ft), I nearly got a burn from the 50 pound line as the MBK Parachute rose higher and copped the full blast of rushing air. Thin white Tyvek trailing behind, the plastic and tape foil was flying well, apart from the occasional buffet from turbulence. With the top row of bridle lines all shortened by a centimeter (1/2") the kite seemed to be holding just a fraction above it's usual line angles. At shoulder height, the breeze was measured at 27kph gusting to 33kph. I was standing in a sheltered location though! To find smoother air, the line was let out to 60m (200ft) before being tied off to a fence. Using spring scales, the line tension was now observed to be touching 4kg occasionally. A lot for just 3/4 of a square meter of sail area! Effective sail area in the air would be more like 1/2 a square meter. BANG! Suddenly the line went slack, and I looked up to see the kite drifting off downwind. The folded up plastic just cleared a tall tree, before disappearing from sight. Fortunately, I later found it near the side of the road going past the beach. The Prusik knot in the short bridle line had cut through the short connector line, both of which were made using 20 pound Dacron. Tsk tsk tsk. Fortunately for e-book readers, I had anticipated this problem and recommended that they use 50 pound line for those 2 bits of the bridle! Predictable flying would be a bonus since I intended to really work the camera this time. Accordingly, Christies Beach was selected as the spot to fly. After a short walk down to the sand, the Parachute was soon up on a very short line. Posing for in-flight close-ups. A check with the wind meter revealed a breeze strength of 25 kph gusting to 31 kph from the SSW. Just a little cloud was about after the thick cover and a few spots of rain earlier in the day. For once, at this location, the tide was out giving ample room to fly. With much more line out, the kite started pulling harder and managed to shift my kite bag across the sand. Quickly digging a trench with the toe of my shoe, the bag slipped in and was able to hold the tension from then on. With the kite anchored it was time to scoot around and try a few different camera angles. Some seagulls flew over and made a brief appearance in one of the videos. The artificial rocky incline bordering the beach, a tall tree and a small rotunda provided some background detail for more picturesque shots. Finally, the line was let out to just over 30m (100ft). Maybe it was the harder inflation due to the stronger wind strength up there, but the Parachute's trim seemed to improve. Also, line angles improved as the kite was getting closer to the rocky incline. Slope lift! That is, air being forced up and over an incline. The MBK Parachute was pulling hard, so after packing it away I re-checked the breeze - 35 gusting to 44 (kph)! 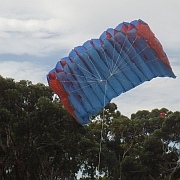 With no signs of instability or damage, the Parachute kite can now be considered well-tested in fresh breeze strengths. The final touch to the MBK Parachute kite was a decorative (!) drogue hanging out the back. Like the full-size sport chutes have, after they have been deployed in free-fall. Sticking to the down-wind side of the large square reserve, I flew the Parachute on a pretty short line while snapping away with the camera. A video was taken on a fairly short line as well. It seemed I might have over-corrected somewhat with one of the brake lines, causing a lean to the left. However, when flying much higher, and with fresh gusts pumping the canopy tight, the kite seemed to settle down. Wonderful! There it was, wandering around on a tight 45m (150ft) or so of braided Dacron. Line angles were modest as always, but the 'chute continued to impress with it's ability to absorb fresh wind with ease. A longish movie was taken, only for a bee to land right next to the shutter button! I think I managed to terminate the movie just before gingerly shaking off the bee. Despite the good wind strength, it was very tricky getting the Parachute into the air today at a small local reserve. The wind strength was only available for very short periods down low due to the fairly tall trees around the reserve. We might pick a better flying spot for this kite next time! I'm so used to flying light-wind kites. Finally, after much fancy footwork and line-work, the parachute made it over the tree-tops at the far side of the reserve. A lean to the right was hampering the kite's performance, and adjusting the sliding bridle knot seemed to have little effect. Which led to a neat idea - adding brake-lines to the trailing edge! The kite may not have sparkling performance in terms of line angle, but what an educational build for youngsters. The design will have all the basic features of a modern sport parachute... Including functional steering for the purpose of trimming the kite for straight flight!